Full length native protein (purified) corresponding to DDDDK tag conjugated to Keyhole Limpet Haemocyanin (KLH). Our Abpromise guarantee covers the use of ab1238 in the following tested applications. 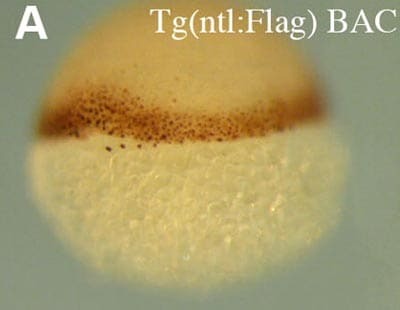 Anti-Flag immunostaining (using ab1238) of ntl:Flag BAC transgenic zebrafish embryos shows expression in the margin at 6 hours post fertilisation. Publishing research using ab1238? Please let us know so that we can cite the reference in this datasheet. There are currently no Customer reviews or Questions for ab1238.